The waiting for ‘the better day’ is taking too long. This lingering headache is sofa king annoying and cause me so much stress. The pain in my arms and legs is beginning to really bother me too. I learned last night that my Norco for pain is no longer for me. It helps with the pain in my body, but then cause me chest pains. [esophagus issues] Normally I can take them with no problems as long as I sit up for 30 minutes or so. Now, not so much. Was on the phone with my Ruby girl and had to get off quickly as I thought I was going to be sick. I shut my Mac and put my head down for a bit and the yuck feeling finally went away. Is it too much to ask for just one day of feeling good? As for me, today, it’s going to be a movie day. Need to re-generate. As I type that, I laugh. All I do is movie days and lie down and rest. Such is life right? Will you be up for the show? We can pull the plug if you aren’t feeling well. I think I’m nixing the Norco for a while and see how it goes. Oh my gosh, the paw prints are too cute!! LOL!!! awwww, Dexter was leaving some love for you and making sure the bathroom is up to par..hehhee. Maybe what ruby said, some medications do not mix. Boy, I am in the mood for a movie day..how about we share some cyber popcorn and a lemonade? I slept through most of the movies, lol but the popcorn and lemonade sounds good!! miss u 2 my lil girl!! Hi Mz T, I truly hope and pray for some sort of relief for you in the very near future i hate to hear of your pain. Being in constant pain is never fun nor is it a way to live. But I am happy for you that things are looking up for you in the way of getting your bathroom almost done, I know that too was a bit of drama for you as well. 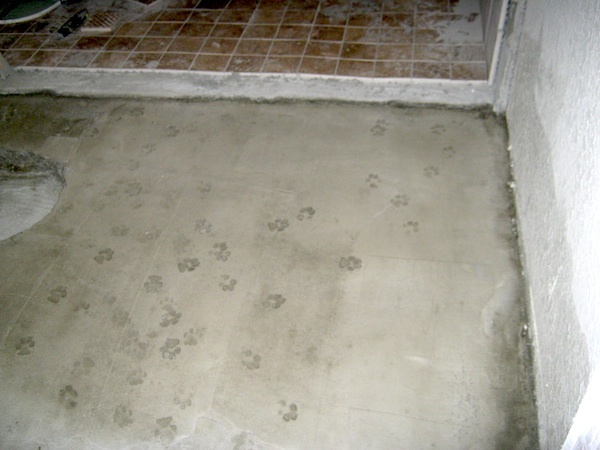 I think the paw prints are too cute, just feel better and relax my friend and try to takwe your mind off the pain (did I say that!) LOL, no put seriously I pray for you and Ruby. Love ya! That Dexter is just too much! He’s lil booger!! lol I’m doing better Bobbi!! Thanks!